The paintings of Leonardo da Vinci have for several centuries with enviable regularity become the subject of controversy among scientists from various fields, art critics and art historians. In the case of the painter's works, the author was most often called into question: since Leonardo did not sign his works, one can focus only on his personal diaries with sketches and the testimonies of his contemporaries. 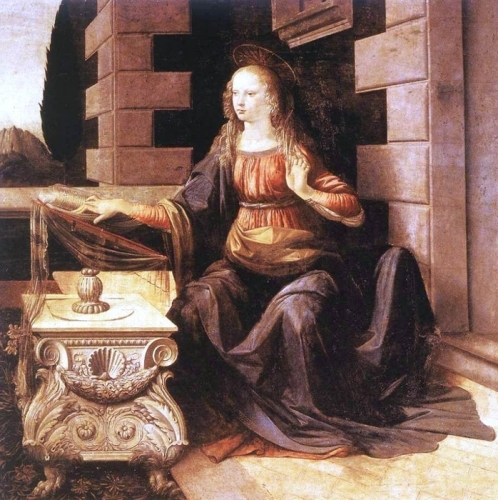 As for the Da Vinci "Annunciation" picture, the researchers did not reach a consensus: some argue that the work was written by Leonardo himself from the first to the last smear, while others are sure that the artist had a co-author. After numerous studies, details were found that can confirm both the first and second versions. Who could be the co-author of the Annunciation? The work was discovered only in 1867 in the monastery of San Bartolomeo and Montoliveto and transported to the Uffizi Gallery. At that time, its author was considered Domenico Ghirlandaio, but two years later the picture was attributed to Leonardo due to the study of the diaries of the artist and comparison of the details of the Annunciation with sketches. In favor of the version that the painting was written by Da Vinci on its own, there is a scrupulously prescribed, hazy landscape in the background and anatomical precision, which is traditional for the artist. For example, the wings of Gabriel Leonardo copied from real bird wings, he writes about this in one of his diaries. However, some unidentified "retoucher", apparently, found these wings are not impressive enough for God's messenger and rather roughly lengthened them. It is worth paying attention to the faces of the heroes of the picture. The face of the archangel Gabriel is similar to the angel that da Vinci wrote in the corner of the "Baptism of Christ" - the work of his teacher Verrocchio, and the face of the Virgin Mary - to the famous "Madonna with a carnation," written by Da Vinci a few years later. However, some researchers hold the opinion that the "Annunciation" was written by Leonardo along with his teacher. They believe that, like the "Baptism of Christ", most of the picture was created by Andrea del Verocchio, and the young master was instructed to write a landscape in the background and the figure of the archangel. One of the radiographic studies showed that some of the work, supposedly done by Verrocchio, was written with fairly large, heavy strokes, and the colors used by it contained lead. As for the angel and the landscape, here the layers of the paint are more subtle, the smears very light, made with lead-free paints. The folds of Maria's clothes look traditionally for Verocchio's heavy and motionless, as if hewed out of stone. Another of the arguments of the supporters of the theory of co-authorship is the sarcophagus standing between Maria and the archangel. This is a copy of the sarcophagus of Piero de 'Medici in the church of San Lorenzo, made by Andrea Verocchio. However, it is possible that the sarcophagus was portrayed by Leonardo himself, as a tribute to the teacher. 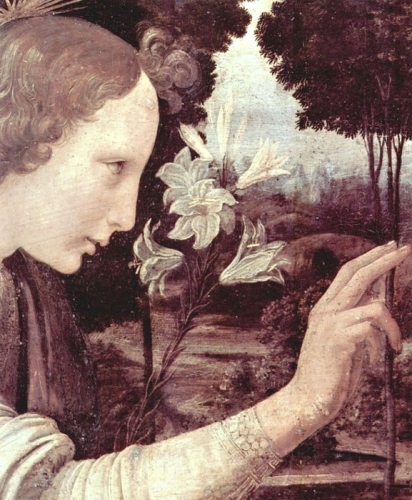 There is another version of the Annunciation, written several years later and kept in the Louvre, which is currently considered the work of Leonardo. However, this picture is much more controversial. Many researchers are inclined to consider it the author of Lorenzo di Credit. Documentary evidence has been preserved that this small panel with a biblical scene was part of the altar of Pistoia Cathedral. Most of the work was done by Verrocchio, and he commissioned the "Annunciation" di Credit, to one of his students. Leonardo's paintings were repeatedly attributed to Di Credit, as well as vice versa, as they studied and worked with Verocchio at one time. Anyway, now the author of the Louvre "Annunciation" is recognized as Da Vinci. Icon-painting and pictorial traditions of the image of the Annunciation were formed almost from the very beginning of the existence of Christianity. One of the earliest works that captured this famous biblical scene is a fresco from the Roman catacomb of Priscilla of the 3rd century. For the most part, the canons and rules here have developed over many centuries before the appearance of Leonardo da Vinci. At the time of writing "Annunciation" artist was only about 20 years old, he has not become famous as an experimenter and innovator, and here, too, did not go against the traditions.